For the next three days you can get Blood Moon, Book II in my Huntress/FBI series, for free on Kindle as part of an Amazon launch promotion. (I know, I'm sorry, exclusive to Amazon for the first three months. It's the financial reality of it. 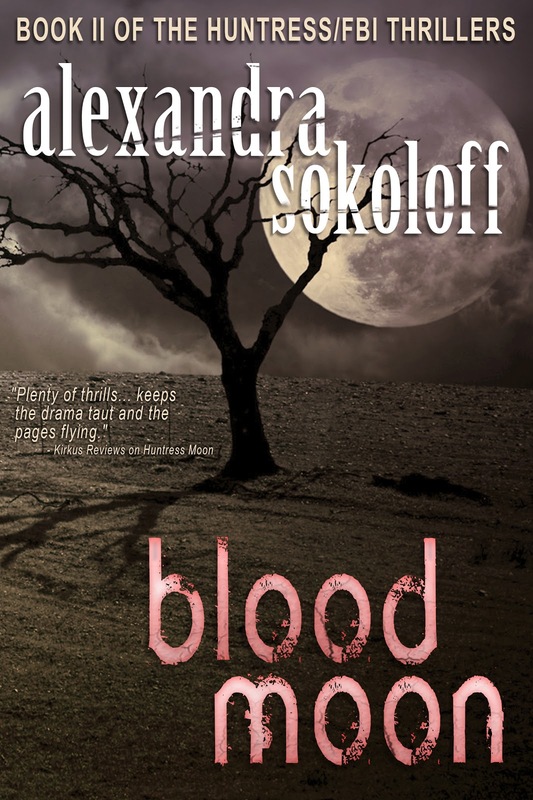 But for readers of this blog - you know me - if it's a Nook or Kobo version or pdf you need, just e mail me at AXSokoloff AT aol DOT com and I will get it to you!). Twenty-five years have passed since a savage killer terrorized California, massacring three ordinary families before disappearing without a trace. The haunted child who was the only surviving victim of his rampage is now wanted by the FBI for brutal crimes of her own, and Special Agent Matthew Roarke is on an interstate manhunt for her, despite his conflicted sympathies for her history and motives. But when his search for her unearths evidence of new family slayings, the dangerous woman Roarke seeks - and wants - may be his only hope of preventing another bloodbath. People who read this blog are always asking me to talk about writing series. I haven't so far because - well, I didn't feel qualified enough. The Huntress series is actually my first. Apart from The Keepers paranormal series, which I write with two other authors, so it's not the same, I've always written standalones, although there are a couple of those that I will write sequels to eventually. For whatever the reason, the series is unfolding almost continuously: the action of Huntress Moon takes place over the course of eight days,; Blood Moon picks up the action two weeks later and takes place over two weeks, with the moon cycle always determining the action. And I know that Book 3 will start a few weeks after that. It feels to me like the pace of a TV series. I don't think I would have done it this way if the series were traditionally published. You have to wait SO long for a book to come out from a traditional publisher. But even though I'm not a particularly fast writer (not with novels, anyway), I know I can have Book 3 out by the end of the year (especially since I don't have to sell a house in the middle of the process as I did with Blood Moon!). That's not a huge amount of time to wait for a book, so I'm pushing the envelope a little with cliffhangers. At the same time, one of my of this series is to leave readers thinking about what they really want to have happen next, emotionally and morally. And what they want morally may not at all be what they want emotionally. It's that conflict that I'm exploring. A bit of a risk, but luckily readers seem to be going with it. I'm sorry that I don't write faster, but aren't we all! I didn't read series books for a long time; I preferred standalones (which pretty much explains why I write them...) Now I have several crime series I'm fanatically committed to (by Denise Mina, Val McDermid, Mo Hayder) and my own feeling is that I wish there WEREN'T so much time in between the action of the books. So I guess I'm writing the way I want to read. I'm interested in hearing from writers and readers - do you like books in a series to stand on their own? Or are you interested in a fairly continuous, connected storyline? Authors, if you write series, how do you handle the time issue? It depends on the series. If it has an overall arc for the recurring characters, and each installment pushes that along while the stories remain fresh, then that's a good thing. If you absolutely shouldn't read the books out of order because you won't understand what's going on, then that's using a series the way it's meant to be used. Too often, though, a series becomes an exercise in telling the same story over and over, and the recurring characters become grab bags of tics and manners rather than living, growing humans. Sometimes, too, a series starts out with the right moves, then calcifies under the pressure of deadlines and contractural obligations. These are the series I'd just as soon do without. When I really like a book—the characters, the setting, the basic plot—I want more of it, so a series is great. Too often, though, an author will say something about how each book in a series “really can be read by itself” but it turns out to not be true. There is a progression through the books of the protagonist’s age, or where she lives, or cars that she drives, or something, and there is a casual reference to one of these in one of the books and you realize that you’re reading a book out of its order, and I find that very annoying. It’s as though the “can be read in any order” declaration is just a marketing ploy, and it makes me feel manipulated, and that right there injects a quality if negativity into my relationship with the author and her books… and I would think that that would be the last thing that an author wants to induce in a reader. If you, the author, want to write several books with a continuing cast of characters, and you want them to be stand-alone books, then be careful in your writing and make them truly stand alone. If, on the other hand, there is an order to them, then don’t tell us otherwise. A good example of truly stand-alone stories is the Sherlock Holmes canon. Almost all of them can be read in any order. The occasional references to previous adventures are, with a few exceptions, to cases to which there are no actual stories (something which has driven more than one Holmes fanatic a little crazy). So… yes, write a series. Just be honest in your description of it. Lance, that's interesting - the idea that you SHOULDN'T be able to read a series out of order. Maybe I'm not a typical series reader in that I often come to a series in the middle, and don't go back to fill in the gaps unless I get truly obsessed with a series, which doesn't happen very often. I think I'm just being realistic - I can't very often watch a TV series in order, and I can't very often read a whole series - just not enough time in the world. I'd hate to miss out on an author I liked just because I don't have enough time for the whole series. It was great to discover you yesterday over at Konrath's blog. I've completed my first series and each book can be read as a stand alone, my readers agree. However, each book primarily follows a different siblings goals but connects to all the others. The Ravensmoore Chronicles are my only books published and are traditionally published. Now comes the dilemma. I would have loved to published more books about this family's adventures but alas I can't do it because the publisher wouldn't be intereseted. I'm not selling millions I can tell you that. But I was grateful to my publisher to get the experience of traditional publishing. Now I want to write another series but there's so much I want to do with it that it may be better to pursue self-publishing. So much debate going on, it makes my head ache. As a reader, I do not like books that end with a real cliffhanger until the next book comes out, but I love books with a protaganist/s that wants me to come back and read another book to see what's going on now. Anne Perry, C.S. Harris, etc. Love historicals. Love Sherlock Holmes and the way Conan Doyle developed that awesome character that so many of us still love. Wish I could write fast too. I am fascinated with what I call connected books - not necessarily a series, but where you see peripheral characters take the main stage in the story, see things from the perspectives of other characters, see the connections as a reader that the characters don't get to see, etc. One of my favorite examples of this is Lawrence Durrell's Alexandria Quartet. I'm in the early stages of doing something similar with my Claire Quartet. And now writing book two of the Borderland books, which are totally different stories but there are a few cross-over characters. I love the ability to create character via a larger 'world view' so to speak. Different times in the characters' lives, seeing characters in different contexts, etc. I was drawing a huge chart the other day that put all the characters in their different stories onto one page. And then tracing the connections and the places they cross paths. I've just finished reading the new book, downloaded last week from Amazon.DE And wow! You've done it again. You know I loved Huntress Moon. Well, Blood Moon is a brilliant sequel, with gripping storytelling that kept me reading into the wee hours. You go to some pretty dark and chilling places in your mind, don't you? Then turn the images into fictional gold. I hope there'll be more from Roarke and Cara. In my paranormal Prophecy series, I had intended on there only being one book, but readers wanted more, which prompted me to write a second book. In my paranormal vampire Hunted books, to be honest, they turned into a series because I really enjoyed the world and wanted to see where it would take me. Now, as a reader, I just love series...but I do tend to only get them anymore from indie or self-published authors, because like you, I hate the wait. Sometimes well past a year on many. I do think many readers feel like I do. I know of many that refuse to read the series until its done. I admit I am guilty of doing that myself. I just finished the first two in your Huntress series, and found myself engrossed in the plot! Personally, I'd love it if Cara gets off, lol. Some people are too evil to be allowed to live. Of course, I don't imagine you can do that. I'm so glad I found your guest blog on Konrath! A wonderful new author to add to my 'must read' collection. I apologize for any typos. I'm on my ereader with a tiny screen! Hey Jillian, thanks for coming on over! Siblings are a great way to do interconnected novels. I love that kind of book. Are you sure you can't publish more on your series? Unless the publisher came to you with the idea, your publisher only licensed the right to publish your books for a limited time, they shouldn't own your characters. You should investigate what your contract really says. Billie, I didn't know Claire was a quartet. I loved the first one. I need to catch up!! Yeah, I'm getting into the idea of interconnected books, myself. It took me a long time to be a series reader but now I get it. Hey Hope - thrilled to have people coming over from Joe's! It is TOTALLY about the readers wanting more, isn't it? It becomes such a symbiotic relationship. I've heard that before about readers refusing to start a series for years until at least three books were built up. Floored me, but I do the same with the TV shows I watch - I haven't seen any of Mad Men yet this season because it's just too frustrating to wait a week between episodes. Give me my gratification instantly, thanks very much!! Richard, I am SO GLAD the book worked for you, thank you! It's been really nervewracking, waiting to see what people who liked Huntress Moon think of the second. I've been holding that breath for a long time, let me tell you! Cara to put my feelings into. E Publishing: Where Do I Start? Huntress Moon, FREE today! 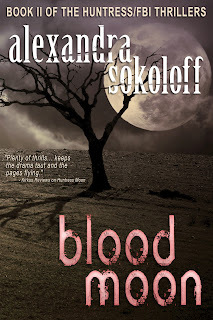 Blood Moon 99 cents!